BDS AGM Seminars - A great success! The BDS conference seminars held over the 2 days in Edinburgh were voted a great success by those attending. The meeting drew a broad cross section of attendees from the deer industry, academia, statutory bodies and NGOs as well as BDS members. Speakers covered a broad range of topics and if you were not able to attend some of the sessions that were live-streamed can be viewed below. You can also view a video of David Wright from Fieldsports TV who interviewed the outgoing and incoming chairs Profs Michael Thick and Rory Putman and event organiser John Bruce. 1. Professor Rory Putman - Chair BDS - "Assessing Chronic Stress in Deer through Infra-red Thermography". 2. Dr Jed Long - "Outdoor Recreation and Red Deer". 3. Dr Mark Dalgleish - "Chronic Wasting Disease (CWD) in Deer, Elk and Moose". 4. Professor Richard Birtles - "Ticks and Lyme Disease". 5. Dr Tom McNeilly - "Risk of E.colis 0157 Contamination in Wild Venison". 6. David Wright from Fieldsports TV interviewing the outgoing and incoming BDS chairs Professors Michael Thick and Rory Putman and event organiser John Bruce. More information and photos can be found on the BDS Facebook page. Scottish Trustee Director and Area Chair John Bruce welcomed delegates, members and Society friends to Edinburgh. Friday 18th May was a full day conference with speakers on deer related topics of national importance including some of particular Scottish relevance. The conference took place in the Budongo Lecture Theatre at Edinburgh Zoo which was conveniently placed adjacent to the hotel. 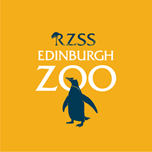 The Royal Zoological Society Scotland Edinburgh Zoo is set in over 82 acres of sloping parkland and home to over 1,000 rare and endangered animals, including Giant Pandas, and was well worth a visit. Saturday’s conference was at the Holiday Inn itself and majored on talks by BDS sponsored researchers, ending with the AGM meeting late afternoon and finally the AGM dinner in the evening. Visitors could then decide whether to travel home on Sunday or spend more time exploring Scotland’s exciting capital city and the multitude of interesting places to visit. 12:00 Scotland’s Wild Deer: A National Approach – what is the role of BDS?